My husband & I like to go out to eat – correction, we love to go out to eat! We love the experience and the meal selections, plus sometimes grabbing dinner (and drinks) is just easier than the process of making dinner. However, now that we have a son I think it’s important to spend quality time around the dinner table. Going out to eat has so many distractions that prevent us from having conversations and truly enjoying each other’s company. We want to instill good values in our son and making family dinner at home a priority is a good way to start. I’ve made dinner every night this week & I love the interest my son has taken to the kitchen. He pays attention to my every move, eager to help and learn. Since he can’t fully assist with making meals yet (he’s only 15 months) I let him play with the pots & pans and even dabble at mixing flour with his own bowl & whisk. Last night I conjured up a new family favorite, Cinnamon Pecan Chicken! Fall is my favorite season & I love baking and cooking fall-appropriate meals. This recipe was easy & turned out better than I had anticipated. Try it for yourself and let me know your thoughts! Pre-heat the oven to 375 degrees and grease a large baking sheet with non-stick spray. Clean and trim your chicken as needed and sprinkle with salt. Place the flour, eggs and chopped pecans in three separate bowls/containers. Whisk the eggs and then add the cinnamon into the chopped pecans, mix until fully coated; I used Fisher Pecan Chips. One by one, place each chicken tenderloin into the flour ensuring the chicken is fully covered before shaking off any excess. Dip the flour-coated chicken into the beaten eggs, again having the excess drip off. Finally, roll the chicken into the cinnamon pecan mixture pressing the pecans into the chicken. I didn’t want our son to have the pecan chips so I coated his chicken in Italian breadcrumbs instead. Bake the chicken for 15 minutes. Flip and bake for another 10-15 minutes until fully cooked. 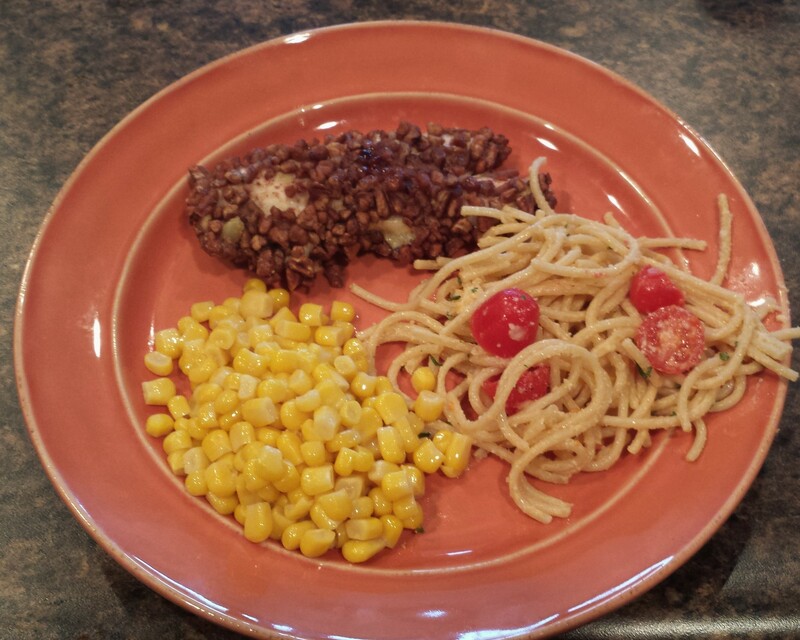 I paired the chicken with corn & parmesan tomato pasta. I love the combination of salty & sweet so I think next time I’ll caramelize the pecans for a sweeter finish!